India has the unfortunate yet dubious distinction of being one of the countries where fire claims thousands of lives every year. Often, these fires are preventable. Reports by the National Crime Records Bureau (NCRB) point to three main causes of death by fire: Domestic fires, industrial accidents, and infernos that sometimes ravage forests and grasslands. India is witnessing rapid industrialization since the past three years. Thanks to rapid advances in indigenous technology, ease of doing business, Make In India initiative launched by Prime Minister Narendra Modi’s government as well as a quantum increase in Foreign Direct Investment and Foreign Institutional Investment have led to an industrial boom in India. Ujjwala and Ujjwala Plus schemes launched by the Central government since 2016 aim at offering over 50 million Liquefied Petroleum Gas connections and cylinders free to economically weaker sections of India, concentrated in rural areas. The proliferation of LPG can increase the risk of household fires, if these cylinders are leaky or not used properly. Additionally, the government is taking steps to provide electricity in remotest corners of the country. Often, high-tension electric cables and domestic power connections trigger fires due to short circuits or vandalism. These facts highlight the critical need for more fire and safety professionals in India. Industries in India need more fire and safety experts now than anytime earlier in the history of this country. Additionally, local fire brigades, security agencies and offices small and large also require fire and safety experts. Hence, you can eye a great career in this field by doing a course in fire and safety. According to various sources, India needs 15,000 to 20,000 Fire and Safety professionals every year. Unfortunately, the country faces a shortage of these skills currently. Fire and safety are the only educational courses that you can do under seven different categories. Unlike most professional studies, you can do a fire and safety course upon completion of your Secondary School Certificate (SSC). Additionally, graduates, engineers, and other professionals can also specialize in fire and safety. Bachelor of Science (Fire and Safety). Post Graduate Diploma/ Degree in Fire and Safety. Assorted Fire and Safety courses. NOTE: Generally, top companies in India recruit Fire and Safety professionals who hold certificates only from highly reputed educational institutes and government approved courses. Hence, you need to find out which course and institute best suit your qualifications. Also, it is advisable to find employability of Fire and Safety professionals from the institute where you intend to take the course. 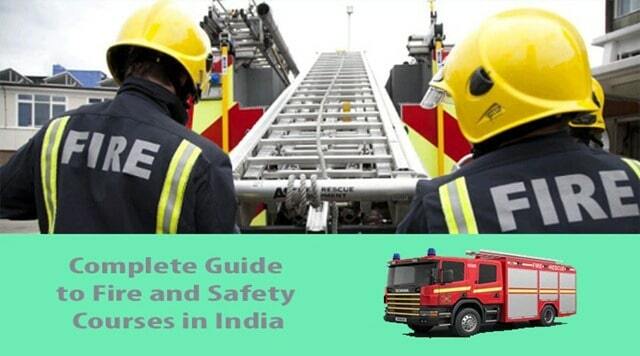 Here we take an in-depth look into various fire and safety courses on offer in India. Certificate courses in Fire and Safety can be taken by any student who has successfully completed Secondary School Certificate (SSC) exams or its equivalent from Central Board of Secondary Examination (CBSE) and Council for Indian School Certificate Examination or ICSE. Generally, Certificate courses are of six-month duration. To enroll for these at any reputed institute, you will need to be fluent in English and Hindi. Some institutes also offer these courses in regional languages. Certificate in Fire Safety and Hazard Management. Certificate in Industrial Safety Course. Certificate in Driver and Pump Operator. Certificate in Fire Safety and Security Management. ITIs across India are operated as autonomous bodies by governments of various Indian states. While a majority of courses offered by various ITIs across India are somewhat similar, only select institutes offer certification in fire and safety. This field of study is also offered by privately run institutes. However, to qualify to work as a fireman for the government or a large company, you may have to pass an examination conducted by an agency or authorized state-run body. Fire Prevention & Safety Course. These courses are of one-year duration. They open vistas for you to work in fire departments and fire brigades run by state governments and municipalities, state-owned companies, banks and various ministries. Diploma in Fire Safety and Engineering. Diploma in Fire and Hazard Prevention. Diploma in Fire Fighting Equipment and Maintenance. NOTE: Diploma and Advanced Diploma courses in fire and safety are also available for Bachelor of Science (B.Sc) graduates. These are highly specialized as we will elaborate in this article. Thanks to an increase in demand for fire and safety professionals, some reputed Indian universities are offering graduation or Bachelor of Science degrees in this field. To study these, you should hold a Higher Secondary Certificate (HSC) or equivalent. Bachelor of Science- Fire and Safety. Bachelor of Science- Industrial Safety. Bachelor of Science- Health Safety and Environment. There are several benefits of doing a B.Sc in fire and safety fields. The reason: You qualify for various advanced post-graduate Diplomas and Master of Science courses in this sector that is fast gaining importance in India. The higher your qualifications, better your employability, remuneration and career prospects. Post graduate Diploma in Fire Safety and Hazard Management. Post graduate Diploma in Health Safety and Environment. Advanced Diploma in Industrial Safety. Advanced Diploma in Safety Management. Post Graduate Diploma in Fire and Risk Assessment. Master of Science, Health, Safety and Management. Master of Science in Fire Safety and Hazard Management. NOTE: Some of these Advanced Diploma and Diploma courses are also open to engineers who possess Bachelor of Technology (B.Tech) degree from any stream. A lot of ambiguity prevails over engineering courses in fire and safety. Generally, top engineering colleges of India including Indian Institute of Technology (IIT), do not offer specialized engineering courses in fire and safety. However, some campuses of IIT are now including advanced fire and safety training as a part of the curriculum for all engineering streams. However, government-owned Cochin University of Science and Technology offers a specialized course called Safety and Fire Engineering. This course offered by the university’s School of Engineering gives a Bachelor of Technology (B.Tech) degree and is highly prized in India. B.Tech in Fire Safety and Hazard Prevention. NOTE: Since B.Tech courses in fire and safety are not easily available, you can opt for a post graduate program that specializes in the field and is offered by a reputed institute. However, you need to ensure employability of students that graduate from the course. Once again, realizing the importance of fire and safety education and professionals for India, several educational institutes have designed myriad short and long-term courses in this field. Master of Business Administration- Fire and Safety: A few state-run and private universities have launched in recent years, MBA- Fire and Safety. The course duration is two to three years, depending on where you choose to study. Basic Fire and Safety Course: This course is offered by various private educational institutes in India. It acquaints students with basics of fire and safety, use of fire-fighting equipment and emergency evacuation procedures. Paramedic Course: Paramedics who work on ambulances are offered special training in handling victims of burns and toxic smoke inhalation by some reputed medical colleges in India. Some medical colleges include the subject as part of syllabus while others make it optional. First Responders Course: Also offered by private educational institutes, this course can be undertaken by anyone who has passed SSC or equivalent. Course duration lasts between two and four weeks. The syllabus includes basics of fire prevention, use of fire- fighting equipment, first aid and evacuation procedures. The course is generally patronized by hotels whose service crew may have to respond immediately to fires at restaurants or guest rooms. Damage Assessment: This is again a short course offered by private institutes. It aims at training staff of insurance companies to assess the damage caused to a premise gutted by fire. There are several reputed institutes and organizations that offer courses in fire and safety as well as provide networking opportunities for professionals. National Academy of Fire and Safety Engineering (NAFS), Nagpur. National Institute of Fire Engineering and Safety Management (NIFE/NIFS), Vishakapatnam. All India Institute of Local Self Government, Bhopal, Jodhpur, Nagpur, Rajkot, Vadodara. Fire and Safety Association of India (15 Chapters in various cities). Industrialization, construction boom, a rise in the number of slum and shanty towns in India as well as increased awareness about fire and safety has led to an exponential increase in job vacancies for qualified personnel. Almost every industry looks for fire and safety professionals at various levels. Armed with appropriate qualifications, you can find jobs at any of the below industries. However, fire and safety professionals are required almost everywhere. Oil, gas and hydrocarbon fuels. Electricity providers and power plants. Fire Departments/ Fire Brigades of governments, municipalities and large corporations. Additionally, fire and safety professionals are also hired by various police forces, state-run forensic laboratories and civilian contractors of the Indian Armed Forces. Similar to every profession, the higher your educational qualifications in fire and safety, better your career prospects. Hence, before enrolling for a fire and safety course, find employability and future career prospects for the qualification you wish to obtain. Another important aspect to consider while choosing a fire and safety course is practical, training. Some courses offer classroom and theoretical studies only. Hence, students without hands-on experience will encounter difficulties in getting jobs. Remember, a career in fire and safety often involves high risks. Hence, it is advisable to enter the field only if you are willing to risk your life. NOTE: Several employers may require you to procure certification from the local fire brigade and other authorities, stating you possess adequate skills. Such certification is provided only after passing very stringent tests. Understandably, fire and safety is a field concerned with protecting human lives and property. Hence, employers tend to be very picky when hiring staff at any level in this field. There are several jobs that you can apply for with fire and safety qualifications. Fire Sub-Officer: At fire brigades and fire departments of companies. Fire Officer: Also at fire brigades and fire departments in the corporate sector. Safety Officer: Large companies, banks, petroleum, and energy firms, electricity generation plants, printing presses, large residential complexes, construction companies, hotels, and hospitality industry, among others. Fireman: A general term for first responders to fires. This is a position you can apply for with a basic fire and safety certificate. There is no dearth of companies looking for firemen. Safety Engineer: Required by all industries. However, safety engineers are in great demand in oil and gas companies. Lucrative salaries are paid to safety engineers posted on oil rigs, refineries, and related installations. Risk Assessor: Insurance companies and banks hire fire and safety professionals as risk assessors. Work includes assessing threats and risks posed by fire to places such a residential complex, hotels and restaurants, fuel stations and other locations. Fire Investigators: Fire investigators are hired by insurers and banks as well as fire brigades. Their job is to investigate the cause of a fire, find lapses in fire prevention and detect arson. Safety Instructors: This is a very important designation in any major company. Safety instructors train employees about how they can respond safely and extinguish a fire. They also teach emergency evacuation techniques and first aid. Loss Prevention Experts and Consultants: Another great job you can find at insurance companies as well as banks and hotels. Loss prevention experts find ways and means to curb losses in the unfortunate event of the fire breaking out. They recommend ways and means to counter fires such as identifying key locations where fire extinguishers, safety alarms, and other related equipment should be installed. Logistics Fire and Safety Experts: Ensuring fire and safety of cargo, especially hazardous and highly inflammable shipments of petroleum products, noxious gases, firecrackers, explosives, and chemicals is very important for a country like India. These experts play a key role in ensuring that no undue mishaps occur while ferrying inflammable cargo by road, rail, and sea. Equipment Testing Experts: Unknown to most people, fire extinguishers installed at residential premises, offices, workshops, and factories need to be refilled every year. Additionally, these extinguishers need to be tested to ensure the firing pin functions properly. Equipment testing experts also check stuff like instant availability of water from fire hydrants, test fire alarms, and similar equipment. NOTE: Regardless of what position you are employed, all fire and safety experts have to participate in and conduct fire drills for their employers. This is done in collaboration with the local fire brigade, Emergency Medical Service, police and other civil defense branches such as home guards. These drills are held at frequencies that match fire hazards and risks faced by a company, factory, hotel or residential premise. Fire drills include testing alarm systems, panic prevention, first responders’ actions, evacuation procedures, the time taken for the fire brigade, EMS, police and other civil defense staff to reach the drill site. They have to chronicle the drill and provide detailed reports to plug any loopholes, lapses, and delays. According to US-based PayScale, which keeps tabs on salaries and remuneration trends worldwide, a fire and safety expert in India earns between Rs. 170,000 to Rs. 730,000 per annum. The figures were updated by PayScale on December 19, 2017. These figures are based on inputs provided by some 920 individuals working in India’s fire and safety sector. On average, a Fireman draws Rs.330,000 per year as salary while Safety Officers get about Rs.282,000 annually. Fire Fighters draw an annual salary of Rs.390,000 and Fire Protection Engineers Rs. 201,980. These salaries are purely indicative and based on inputs provided to PayScale. Your salary could be very different and will be based on qualifications, expertise, and experience. Refilling and testing fire extinguishers. Dealing with fire safety equipment including extinguishers, fire alarms, and smoke detectors. Fire and Safety Consultancy Services. The heartening news is, such services are not available across India. Currently, such businesses are concentrated in industrial belts and metro cities. An urgent need to provide these services at newly developing residential areas, upcoming industrial zones, semi-urban and rural locations, currently exists. An estimated 18,450 persons perished in fire relate accidents across India in 2015, according to statistics compiled by National Crime Records Bureau and Open Government Data of India. This translates as an average 50 persons died in fires daily. The figure represents cases recorded by police. Unconfirmed reports peg the figure much higher, at around 21,000 persons per year or about 57 persons per day. NCRB reports indicate, over 65 percent fatalities due to fire in India occur among women and children. However, higher mortality rates among women and children are attributed to domestic or household fires caused by short circuits and kitchen accidents. Statistics for 2016 are being compiled but initial findings by NCRB and OGDI indicate, some 150,785 persons in India died in various accidents, including fire. The Fire Risk Survey (FRS) 2013 for India, done by Pinkerton and the Federation of Indian Chambers and Industry said, fire accounted for 8.45 percent of the overall ranking of risks in this country. The largest cause of fires in India are electrical short-circuits at homes, offices, industrial units and in vehicles. Other shocking findings of the FRS reveal, India’s hospitality sector that includes hotels, lodges, restaurants and bars ranks as the second most fire-prone industry. IT/ ITES, as the fourth-riskiest industries for fire, while manufacturing sector ranked much lower, at sixth, for fire risks. Indian households rank topmost- at No-1- for fire outbreaks. Surprisingly, households in major Indian cities are at higher risk of fire compared to rural counterparts. Facts and figures presented in this article amply highlight the dire need for fire and safety professionals in India. Additionally, steps also need to be taken to promote awareness about fire and safety among Indian households and all levels of employees at companies and factories. Unfortunately, arson is also common in India, where mobs burn vehicles, commercial establishments, government installations or even residences to vent fury over something. Terror attacks on India have also led to a surge in demand for fire and safety experts in almost every government enterprise and the private sector. Regardless of causes, victims of fires- individuals, families, small and large businesses face immense losses. Sometimes, fires wreak irreparable damage to people and organizations. Given this scenario, people are becoming more aware of fire prevention and importance of safety. Hence, studying a good fire and safety course will pave your way to a great career while helping the nation. Indian insurance companies are paying billions of Rupees annually for claims arising out of fire-related accidents that can be prevented by fire and safety experts. Before concluding, we repeat, fire and safety jobs often involve high risks. Carefully consider these factors before zeroing on a fire and safety course.